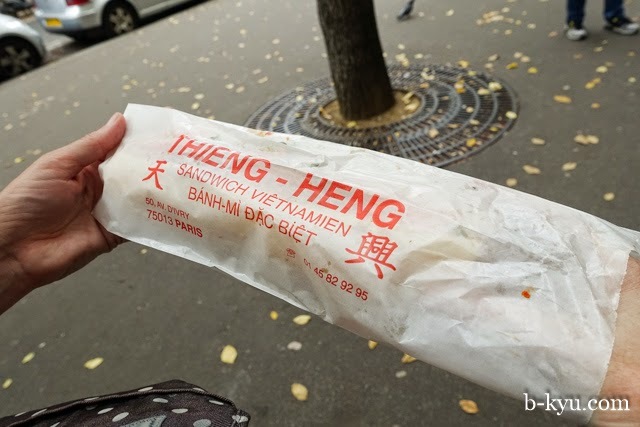 Eating a Vietnamese pork roll in Paris is one of those circular journeys that food often takes. Parisians have embraced the familiar baguette with its exotic fillings, the price and taste causing lunchtime queues and devoted fans. 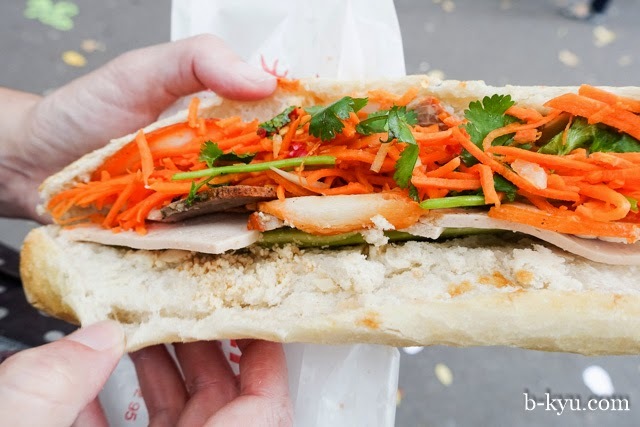 The French took their bread and pate to Asia, where it was transformed into the classic banh mi thit. 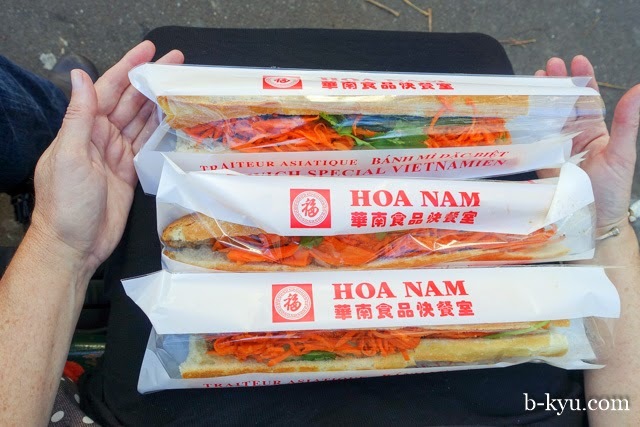 The bread baked in Vietnam changed from long baguettes to a crusty smaller and lighter roll, the kind we are familiar with in Sydney. 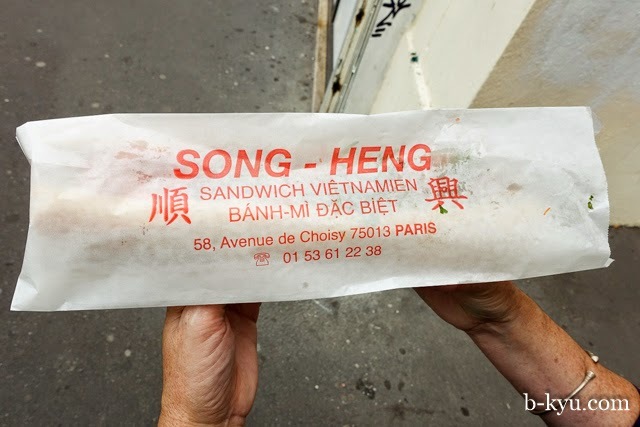 Generations later, Vietnamese migrants settled in Paris bringing their favourite sandwich with them, which changed back again to use the longer and heavier French baguette and so the Parisian version of a banh mi was born. 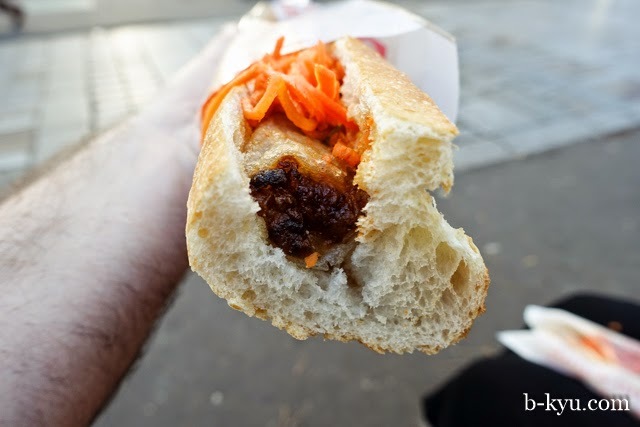 Heading into the Quarter Chinois or Asiatique in the the 13th was the perfect place to find a banh mi. There's a big Vietnamese community here, so they just had to be out there. Ordering a 'dac biet' or 'special combo' style was new, and at first I was a little bit confused about what to get as the menus were in French (of course). Usually I just get a classic version with pork meat, pate, pickles and salad so the variations were a little overwhelming. Most comforting though was the exact same question asked at the end, but in French - "voulez-vous piment?" ("would you like chilli with that?"). Oui! Our first experiment was a combo style at Song Heng. The roll in the end was filled with the classic roast pork meats, shredded carrot and salad. The roll was a little soft, I expected a crunchy French roll as it was still early in the day and they should still have been crisp and fresh. At €2.80 this was one cheap lunch for Paris though, which made a welcome break for the budget. 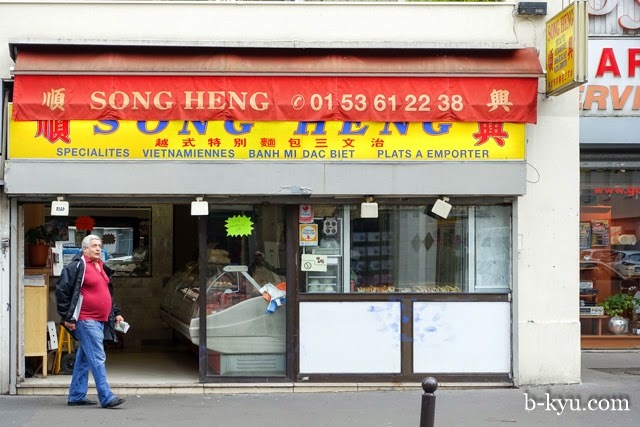 Song Heng is at 58, ave de Choisy, 75013. 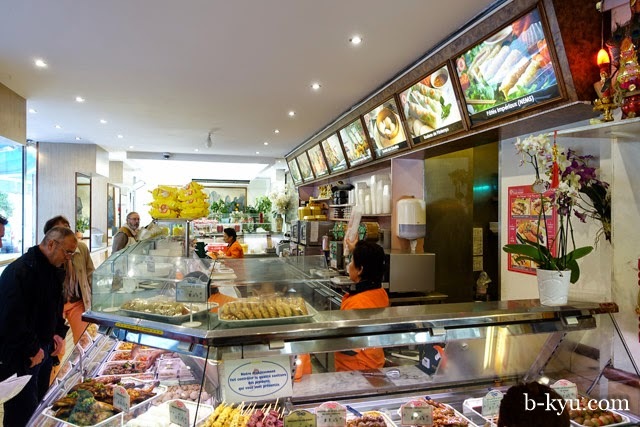 They also have a range of ready made takeaway fried treats in the counter at front. 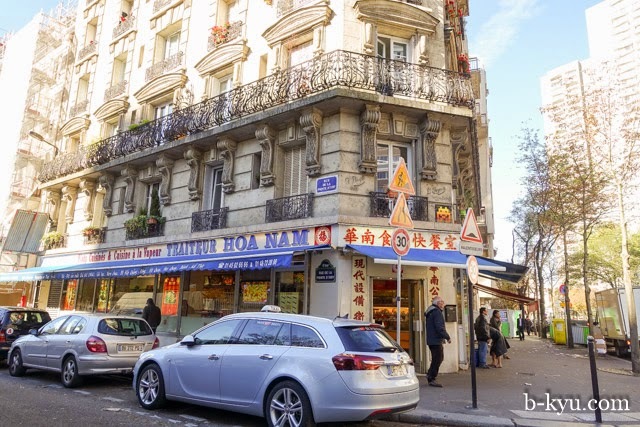 Along Avenue d'Ivry (the other main street in the Quarter Asiatique) is Thieng Heng. We saw queues for this place early in the day, we love how the passion for a good pork roll has taken hold in Paris too. This roll was more what I expected as a classic filling. There was one interesting difference - there was a layer of finely minced chicken along the bottom which added another interesting flavour to the mix. 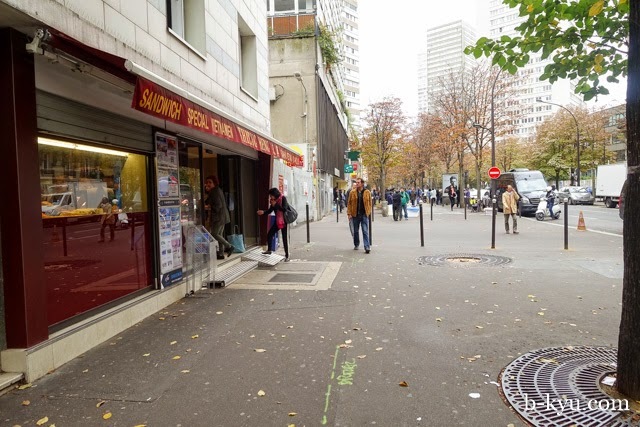 Thieng Heng is at 50 ave d'Ivry. Sniffing our way around the streets, it was this corner store we really couldn't wait to get back to, Hoa Nam. 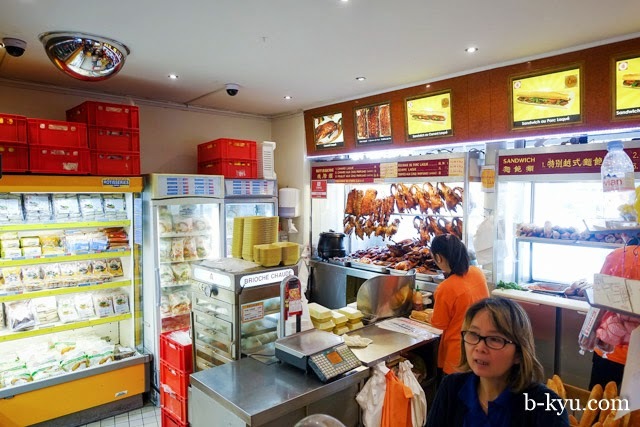 The inside of this store had just about everything you could wish for, roast ducks, steamed buns and a huge selection of banh mi and fillings. Along the other side of the store was a range of ready made foods that you could takeaway. Grilled chicken ready to take home. The selections were colourful and fresh, far better looking than what we had seen in some other places across the city. 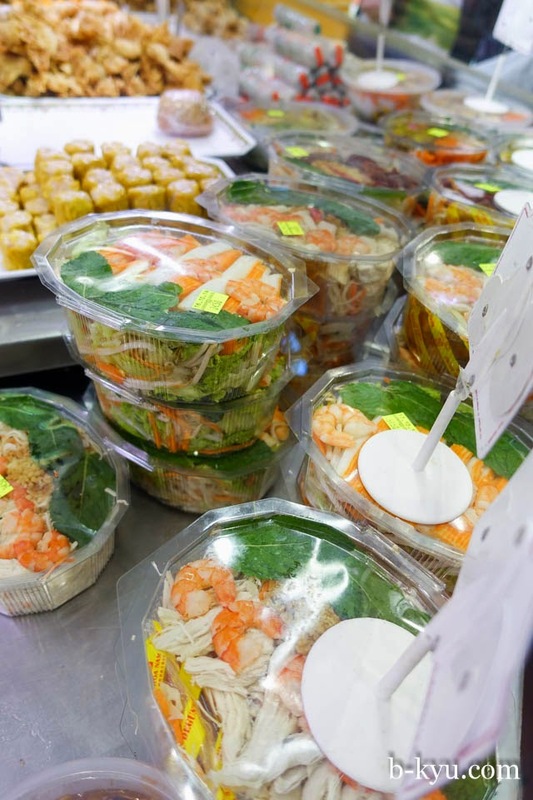 Paris is one place that really celebrates a good salad, and the selections here don't disappoint, filled with shredded lettuce, grated carrot, shredded chicken, shelled generous sized prawns and fragrant fresh herbs. But it was their sandwich board which had lured us back. 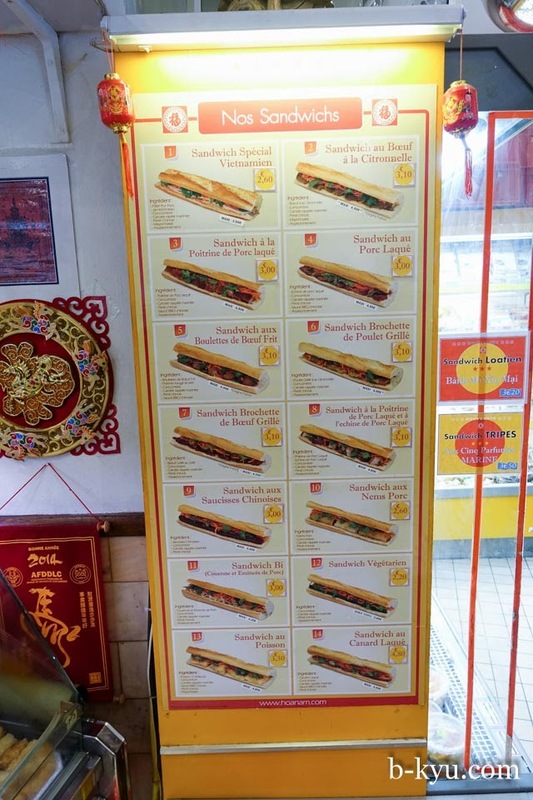 Fourteen different rolls to choose from here, with a few other specials advertised around the store. 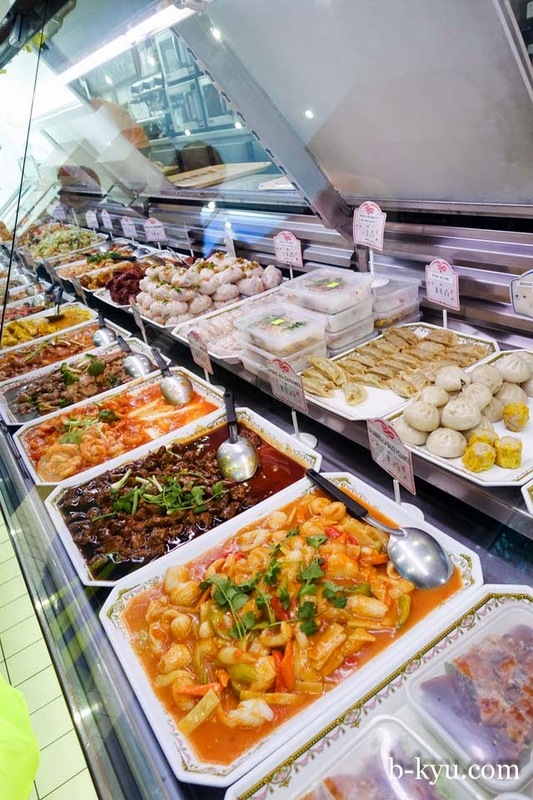 There are classic styles, meatballs, lemongrass beef, roast chicken, grilled beef skewers, fish, roast duck and spring rolls to fill your bread. A final food choice dilemma was to be faced, either the Loatien style or a roll filled with intestines? Because we couldn't decide which single one to get, and thought we might not get back down here, we ended up with three different rolls for lunch. Shawn begs for this one, sandwich aux nems porc, a roll filled with salad and spring rolls. The greasy fried rolls give a meaty and satisfying crunch to the baguette, leaching out a little bit of grease onto the bread and salad. €2,60. 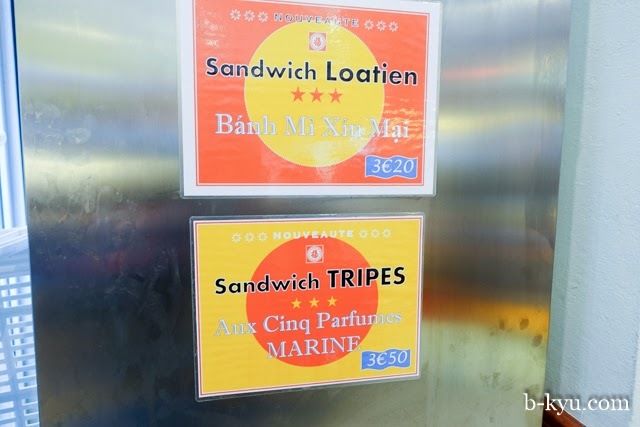 It was so hard to choose between the sandwich Laotian and the tripes, but offal won in the end. This is one filling I would dearly love to see done back in Sydney - anyone? Please? The intestines were cut into little rings, well cleaned and not overly whiffy and the hoisin sauce gave it a good flavour base, even a little mask to the strong smell. A wonderful roll. €3,50. Finally we munch through a roast duck (sandwich au canard laque) roll, which was highly hyped in our mind before we tried it but proved to be the least exciting of the three. The duck was a little dry and needed some extra sauce or fattiness to give it some oomph. €4,80. 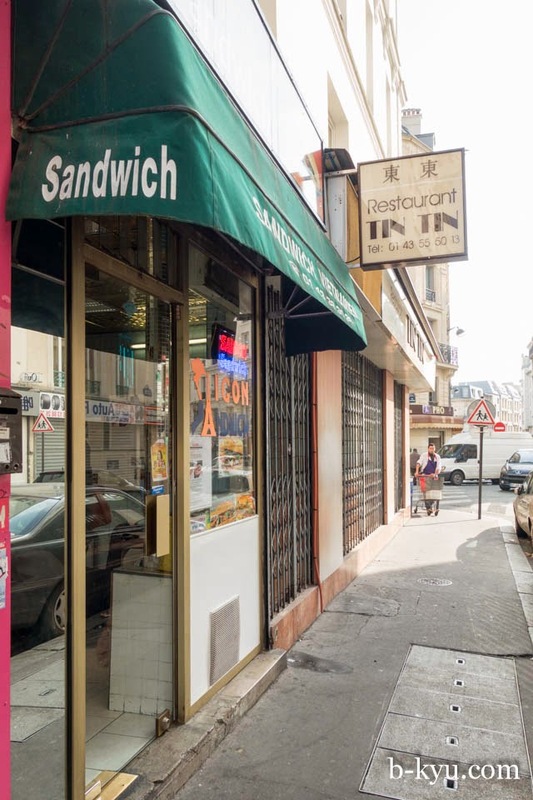 Traiteur Hoa Nam is at the corner at 51 ave d'Ivry. We got up into Belleville to try some more rolls to balance out our Parisian pork roll adventures. 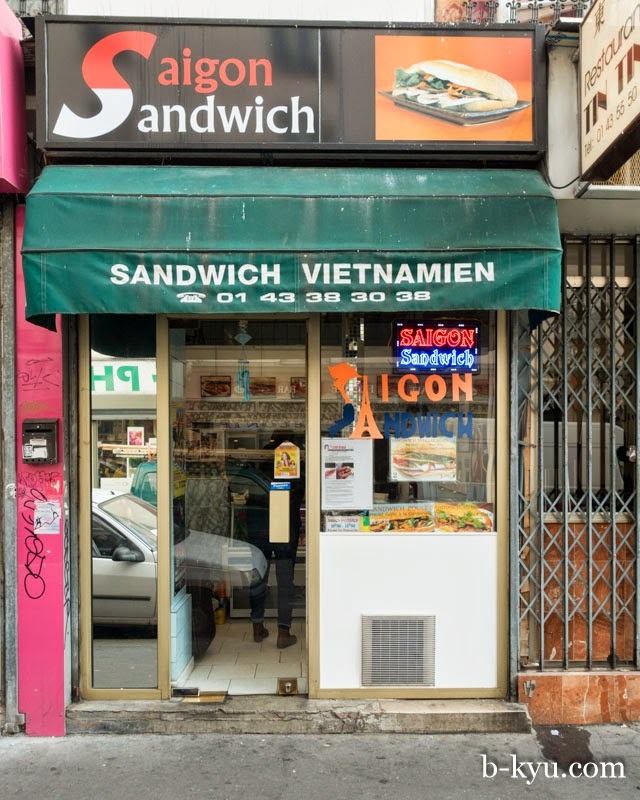 Saigon Sandwich is tucked down a not so busy street right near a Chinese restaurant serving food from Wenzhou which we sorely regretted not trying as well. The rolls here had a great crisp to the bread and plenty of carrot but not much on the other green fixings. This small store pumps out rolls and flashes smiles for free, the ladies in here were so friendly and helpful when we had some language issues. 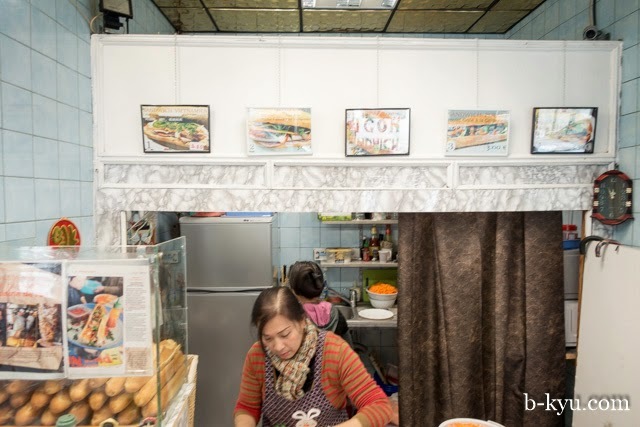 Saigon Sandwich is at 8 Rue de la Présentation, 75011. 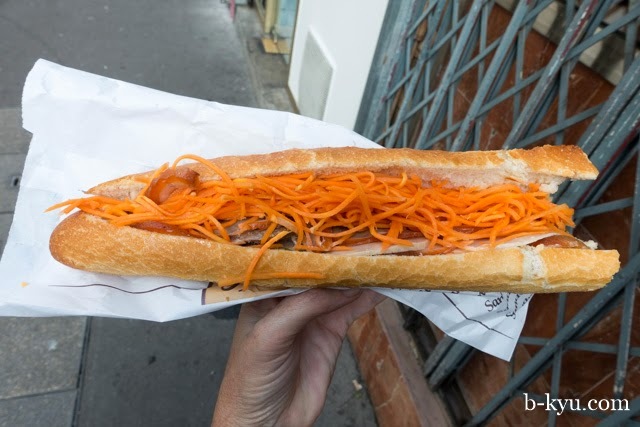 It's the Marrickville Pork Roll of most best of lists about banh mi in Paris. 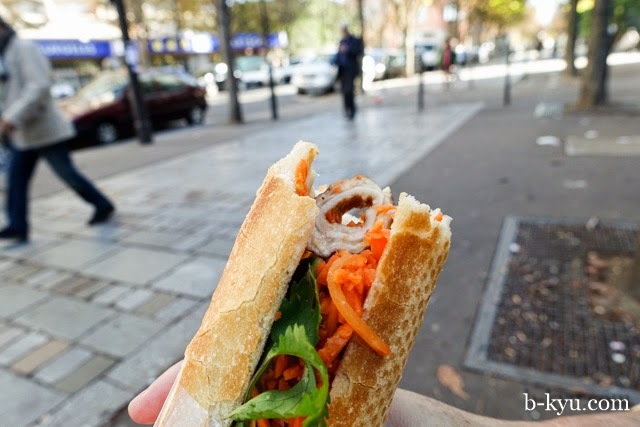 There were other banh mi places we saw along our walks, too many for us to try them all (and we did have to get some French food in there sometimes). Just out the front of the large Tang Freres supermarket in the Quarter Asiatique was a store selling banh mi and all sorts of fried goodies. 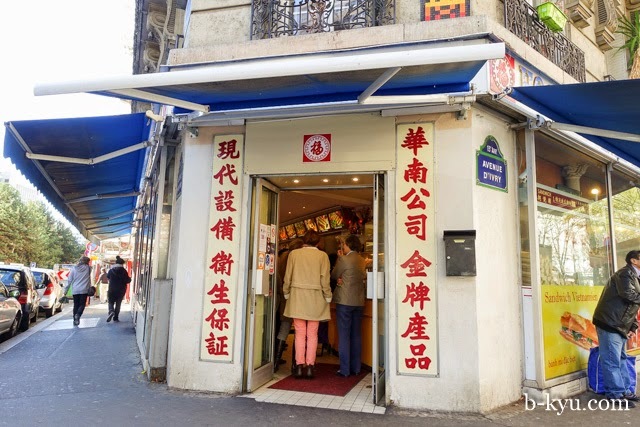 Mekong is on the northern edge of Quarter Asiatique, at 135 rue de Tolbiac, 75013. 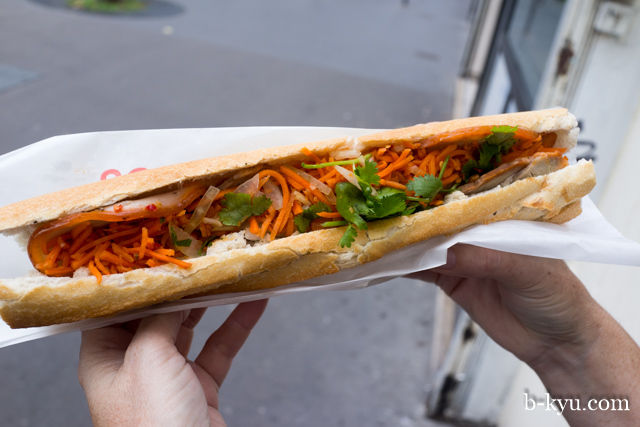 TJ Asian Fusion Banh Mi and Bubble Tea Shop is at 86 rue Baudricort 75013, just around the corner from Hoa Nam. Up in the 17th - Sen Trang is at 21 Rue Guy Môquet, 75017. Pork rolls were a perfect way to balance out getting opportunities to eat more French bread and satisfying our Asian food cravings. 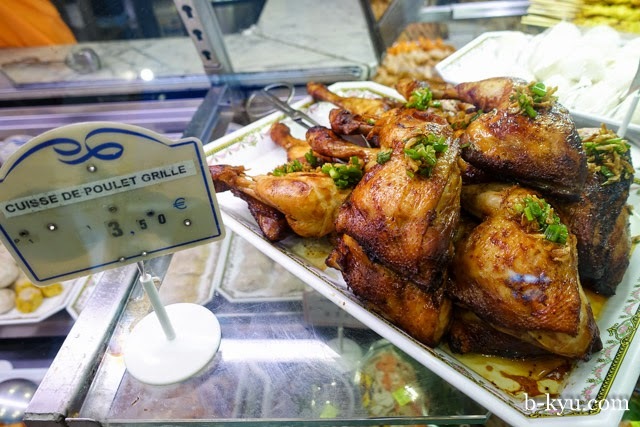 They also work out to be a good cheap lunch, with most basic rolls about €2,80 and the most expensive (roast duck) about €4,80. 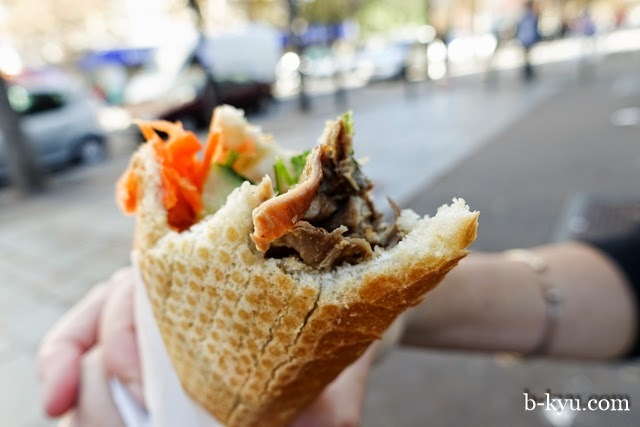 We love pork rolls, and we love Paris. Ce est un blog alimentaire très intéressant !!! Wow, love the sound of spring roll and intestines banh mi! The opening intro was interesting!